The rise of craft beer has led to an increased interest in the provenance of beers, in many ways. Some people are keen to know who brews their beer, both in terms of ownership of the brewery and where it is actually made (particularly as in some cases brewing companies don't make it easy for you to find out) and also in terms of the ingredients. This is most often seen in the case of hops, particularly at harvest time. In the case of this limited release from Two Birds, the aim is also to shine a spotlight on the barley that makes up the majority of the grain bill in most beers. 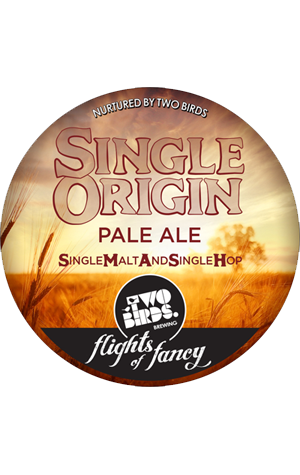 Single Origin is a SMASH beer – single malt and single hop – with both those ingredients coming from a single source. NSW farmers John Campbell and C & W Jnr grew the Gairdner barley and the hops were sourced from a single acre plot at Hop Products Australia's Bushy Park farm in Tassie. With so little going in, it's a pretty simple beer, with the malt providing cereal like characters reminiscent of an English golden ale and the hops supplying a mix of peach and lemon curd. The spent grain was also used to make bread by Brasserie Bread so if you're trying it at the Two Birds Nest see if there's any still around.